The DC universe is in chaotic disarray. The villains are uniting, Batman's Brother Eye�satellite has gone rogue, a war has erupted in space, the Spectre has gone insane, and the trinity are no longer speaking. And that's only the tip of the iceberg, for events have forced the hands of those who survived the first Crisis to come out of isolation... And they're not out to save the world, but remake it. But it's hard to tell who are the heroes, and who are the villains... And most importantly, who will be forced to make the ultimate sacrifice to save all of reality. There's two gigantic flaws in this novel that are hard to get around. 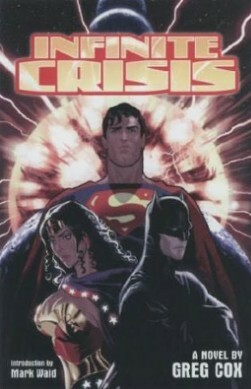 First off, it's a faithful adaption of the Infinite Crisis miniseries. This is a bad thing. You see, by being 100 percent faithful, it ends up leaving a lot of loose ends, such as the disappearance of Blue Beetle, Animal Man, etc... Plus stuff like Kyle becoming Ion. It's faithful, but as a novel with no guaranteed follow up in prose form, it falls flat and feels incomplete... Which raises my second, larger qualm. It begins with Infinite Crisis #1. Yeah. It skips Identity Crisis, Countdown, the five miniseries, and various other connected events to jump right to the start of the miniseries. This is the same as trying to start Lord of the Rings halfway through the middle volume. It fails as a result. The Crisis truly started with the death of Sue Dibney, escalated when Ted Kord was murdered, and shunted into high gear with the miniseries. By passing over all of that, we literally only get half, maybe only a third, of the story. The first Crisis novelization avoided all these pitfalls by focusing it on a single character, Barry Allen. This Crisis, however, has no such benefit. It lacks focus, depth, closure, and most of the actual building action. An utter disaster saved only by the fact that the stories it's comprised of, and which led to it, are all readily available in the comic shops and book stores. Cover - 2: Yes, the Trinity is an�aspect of the story, but there are so many other aspects that ignoring them is, bluntly, foolish. There's no sign of Alex Luthor or Superman of Earth-2. No trace of Donna Troy's team, or the OMACs, or the Spectre... The Trinity's roles are just one piece of the puzzle, and shortchanging the rest is inexcusable.